Clear soup is sometimes part of a hospital diet, or it is used to help squelch your appetite when dieting. Understanding what a clear soup actually is helps you properly adhere to a clear liquid diet and avoid complications. Clear soups are often a base for more complex soups, stews and sauces. Clear soups may be part of a pre- or post-surgery clear liquid diet. A clear liquid diet offers you some nutrition, calories and salt, but keeps your digestive tract clear for tests such as a colonoscopy, or to prevent nausea post-anaesthesia. If you do not stick to clear soups and other liquids, you may make yourself sick or render your tests inaccurate. You may also seek out clear soups as a diet aid, as eating a serving of broth-based or clear soup prior to a meal has been shown to curb overall calorie intake in a study published in the journal “Appetite” in November 2007. For a clear liquid diet, a clear soup is one that you can see through and that is liquid at room temperature. It should not contain any vegetables, noodles or chunks of meat. Although chicken noodle soup and minestrone are broth-based and low in calories, they are not clear because they contain ingredients along with the broth. These types of soup might be appropriate for dieters, but not for surgery patients. 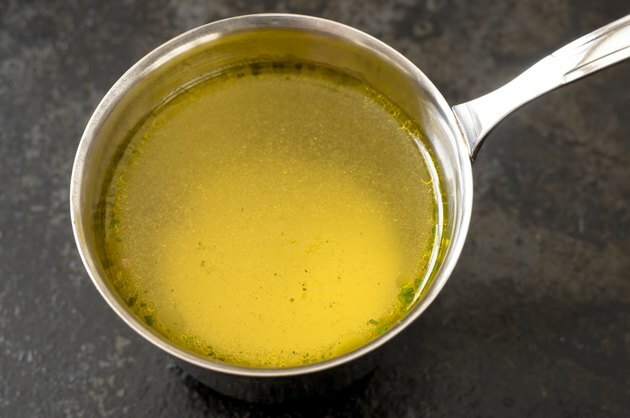 Consommé, a French clarified meat or fish broth, is a classic version of a clear soup. Broth, or bouillon, is another common clear soup. You can make any number of broth flavors, including chicken, turkey, beef, vegetable and mushroom. In Japanese cuisine, dashi – a soup base made with dried tuna or mushroom flakes and seaweed – is also clear when strained. While these soups may be made from scratch, you can also find them in cans, boxes, powder and concentrated paste or cube forms. Canned or boxed broth is often high in sodium. One cup may contain 800 mg of sodium, or more. Look for low-sodium versions when possible to keep your overall sodium intake in check.